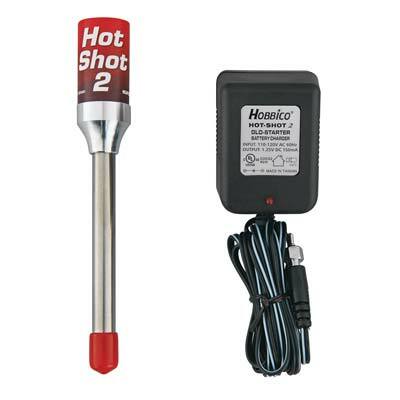 This is a Hot-Shot #2 Long Glo-Starter with Battery Charger. This is used to heat glow plugs while starting glow-powered engines. Proven Twist and Lock Connector ensures a secure, solid connection that won't come off, providing safer, faster starts for your model. Included AC battery charger with hex-shaped charge end recharges the Glow Starter in 10 hours. A red LED glows as unit is charging. Removable Red rubber socket cap prevents shorting and any dirt ordust debris from entering into the the shaft. How to use: To lock onto your engine's glow plug, place the end ofthe Hot Shot 2 over the plug and push down. Twist the Hot Shot 2clockwise and it locks into place. The charger that was originally packaged with this Glo-Starterhad a 150mAh charge rate which requires a long time to charge the large mAh battery. The customer charges the battery initially for 12 hours; 24 hours for more frequent fliers.